Includes Over 250 Army Counseling Examples! 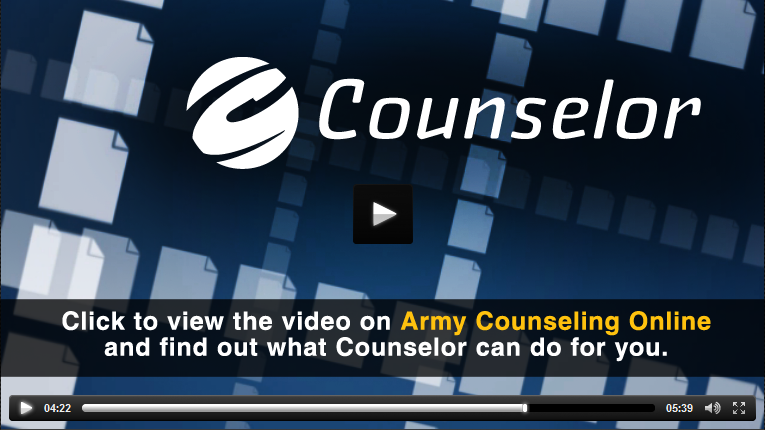 Counselor is the next generation of army counseling software from ACO. The software contains over 250 example counselings and documents spanning 76 different categories. Each example comes complete with checklists, regulatory extracts, and guidance on how a leader should react to every scenario. Counselor includes mentor advice, and event-specific checklists, written by Senior Army NCO's and Officers. These documents provide insight to walk you through the counseling process from start to finish. This guide-on-the-side approach grants access to experience for those times when local leaders and mentors are not available. View all of your Soldiers in one place alongside a full counseling history, and any notes you've made about the Soldier. Do you need a list of Soldier's that have not received their monthly performance counseling? How about a list of pending counseling assessments? Counselor can generate/save custom reports, allowing you to organize your information in a number of powerful ways. Counselor also pre-fills counseling forms with Soldier data, eliminating redundant data-entry and reducing the risk of clerical error. Doctrine concerning counseling is not easy to find because counseling sessions can focus on any of a wide collection of collection of topics. All counselings include regulatory extracts pertaining to the situation. All Army regulations referenced by Counselor's guidance are available for viewing inside the program in their full versions. Putting nearly 80 Army regulations at your fingertips. Never worry about accidentally deleting an important document. Counselor uses an integrated recycling bin so you can recover deleted documents and soldiers. Take your data with you with Counselor's import/export feature. Moving to a different office? Simply export the data from the old computer, and import it to your new computer. Buying for an entire unit? Counselor supports volume licensing (VLK). No one wants to track an overwhelming list of keys. With our VLK management system, you can choose how many licenses you want to buy, how many keys you want to use, and manage your licenses from anywhere with our web-based licensing management system. In addition to the ample information found in Counselor, it also stores various Soldier data and automatically fills it into the DA 4856. The soldier management tools also allow you to see a full counseling history, keep notes, review issued counseling statements, and generate counseling history reports for an entire unit filtered by criteria of your choosing. Counselor puts almost 80 Army regulations at your fingertips for your convenience. All Army regulations referenced by Counselor's guidance are available for viewing inside the program in their full versions. Take your data with you with Counselor's import/export feature. Moving to a different office? Simply export the data from old computer, and import it to your new computer.